The Civil War has ended but not because the South surrendered, instead it’s on hold while both sides face a new enemy – the chewers, dead men who’ve come back to life. Cyrus Joseph Spencer didn’t fight in the war and couldn’t care less about the United Nations of America that resulted from it. His main concern is making money and protecting his crew from all manner of danger. 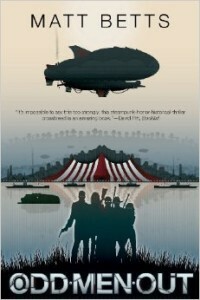 But when tragedy strikes, he’s forced to take shelter onboard a dirigible piloted by the U.N.’s peace-keeping force. It’s soon apparent that many more dangers are lurking and Cyrus must decide whether to throw in with strangers in a desperate bid to protect the country or cast off on his own. My steampunk / alternate history novel came out in the summer of 2013 from Dog Star Books.